Video ad startup Viewbix is announcing that it has raised $3 million in additional funding. The company basically wraps videos in a custom player, so if you’re an advertiser, the player can include your branding, as well as the ability to collect contact information and more. You can see sample videos on the Viewbix website, including a Cuisinart YouTube video that’s been wrapped in a Cuisinart-branded player. 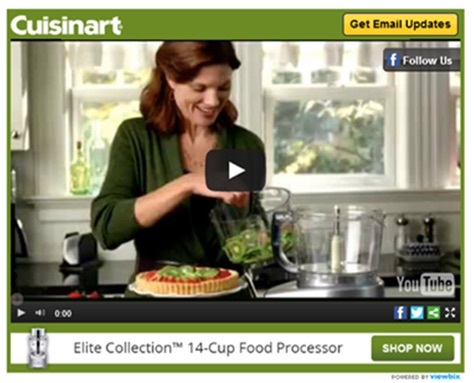 The player includes buttons for following Cuisinart on Facebook, for signing up for the company’s email list and for buying the product in question. That means consumers can take direct action on an ad right while the message is fresh. Plus, there’s detailed analytics data about who’s watching the video and interacting with the player. We’ve written about a number of other startups trying to offer interactive or personalized video ads — indeed, it’s something that AOL (which owns TechCrunch) has also experimented with. In some ways, building a player around a video seems less exciting than adding interactivity to the video itself. But Stefansky noted that his approach makes things easier for the advertiser, since you just take an existing video and create the player in a few steps (as he demonstrated for me). The new funding came from 2M Companies, as well as previous investors Canaan Partners and Longfellow Venture Partners. Viewbix has now raised a total of $6 million in funding, and the Israel-based company plans to open a New York sales office soon.